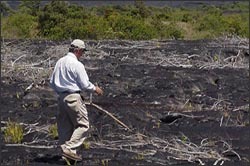 Accessing regrowth in a Hawaiian lava field. Landsat observations have found increasingly wide acceptance within the science and applications communities over the program’s lifetime. As one measure, the Science Citation Index records well over 3,200 peer-reviewed articles making use of Landsat data since 1972, with significant increases in these citations over time. Similar discussions are found throughout the popular science literature. Early applications of Landsat were largely confined to the remote sensing science community and often reported on new pathfinding uses of remote sensing. Today use of Landsat data has evolved, becoming not only a fundamental data source for addressing basic science questions but also has come into its own as a valuable resource for decision makers in such diverse fields such as agriculture, forestry, land use, water resources and natural resource exploration. Over the past three decades, Landsat has also played an increasing role in diverse applications such as human population census and monitoring the growth of global urbanization and deletion of coastal wetlands. As human populations increasingly dominate the Earth’s land areas, understanding changes in land cover and land use from year to year becomes increasingly important for both decision makers and human occupants of the Earth. Agricultural productivity evaluation and crop forecasting require satellite data because they can perform the swift and frequent inventories fundamental to accurate yield forecasting. Similarly, understanding current conditions of and changes in fresh water supplies also requires the systematic repeat coverage provided by the Landsat system. NASA’s Land-Cover and Land-Use Change Program (LCLUC) uses Landsat data to develop socially relevant interdisciplinary science that can be applied to natural resource management questions, starting with agricultural land use change.